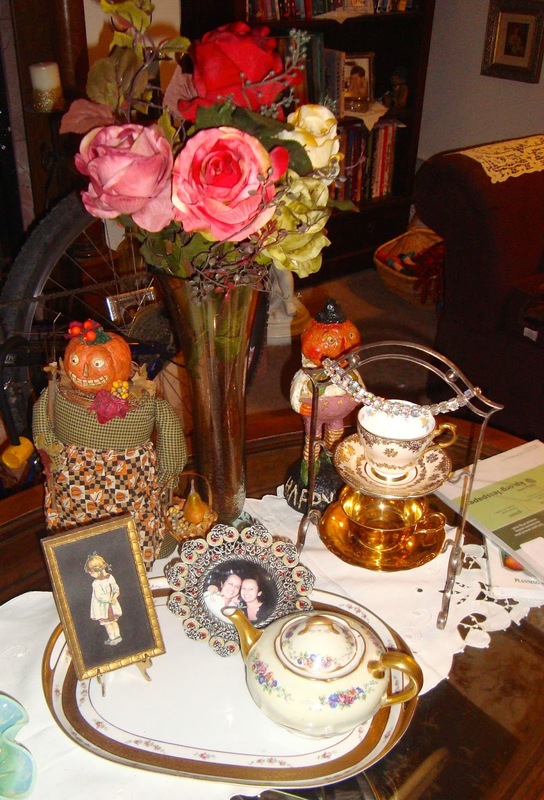 Martha's Favorites: DECORATING FOR HALLOWEEN, CAN'T FORGET THE TEA CUPS! DECORATING FOR HALLOWEEN, CAN'T FORGET THE TEA CUPS! Hello Ladies! Welcome to Tea Cup Tuesday No. 242! Our weather is finally cooling down a little bit. It is hard to think about Fall when we are still 90 degrees in Los Angeles. We are rationing water so the yards are barely staying alive. My week was very busy, but I did managed to squeeze in two very fun things. First, I was at a Scrapbook Convention (yes they have their own convention's) and secondly, I went to the best estate sale ever, by accident. Love it when that happens. The lady that lived there owned a local boutique. All her items were very cute and on the French Country side. I have a CRV and the back was almost full. The most I paid for anything was $5.00, $1.00 or $2.00 was the average price. Tell me, how could I pass that up? Impossible, right? So, I guess, I have backslided a little from "my less is best idea." I couldn't help it, really. My weeks have been so stressful for so long. I caved, it's true, I was weak. I couldn't help it. Thought I might have felt regret, when I got home, but I didn't. Have mercy! I will try to show you some of the loot next week. Still have not finished unpacking. I am sharing two cups this week. 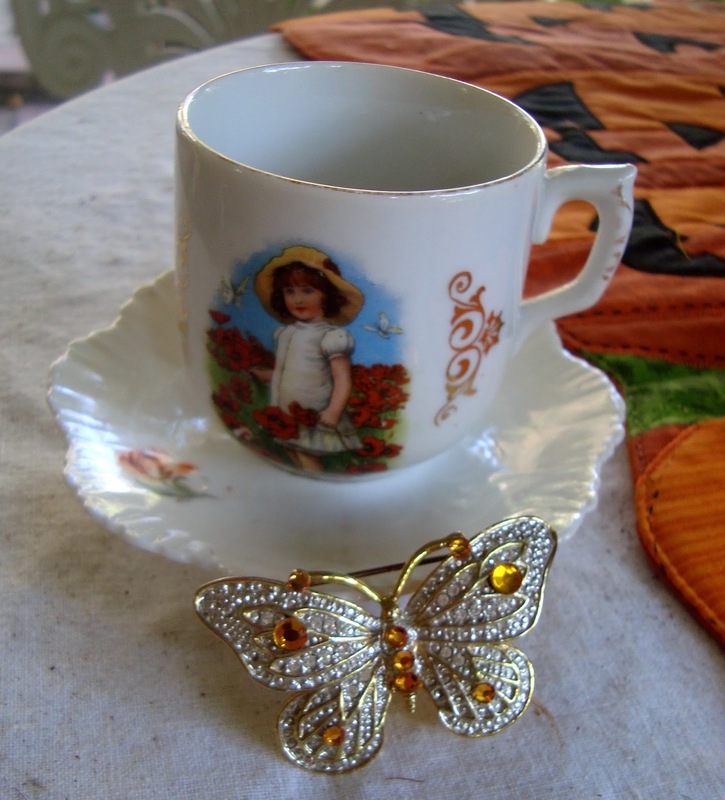 The first one is this cute little girl cup that was made in Germany. I love how she is surrounded by red flowers. My next cup is a Rosenthal Elfenbein tea cup. Pattern name Konfetti. It is so cute, looks like it is right out of the 1950's. 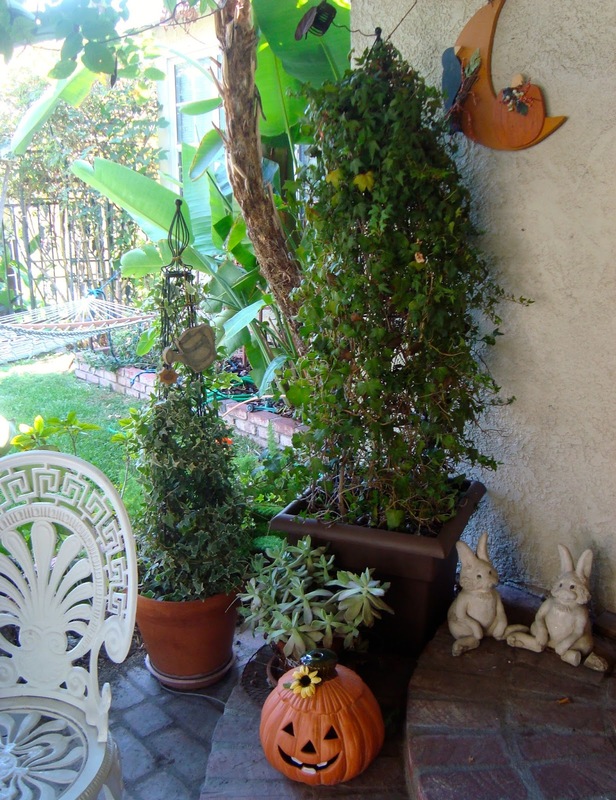 Also sharing some pictures of my Halloween porch. 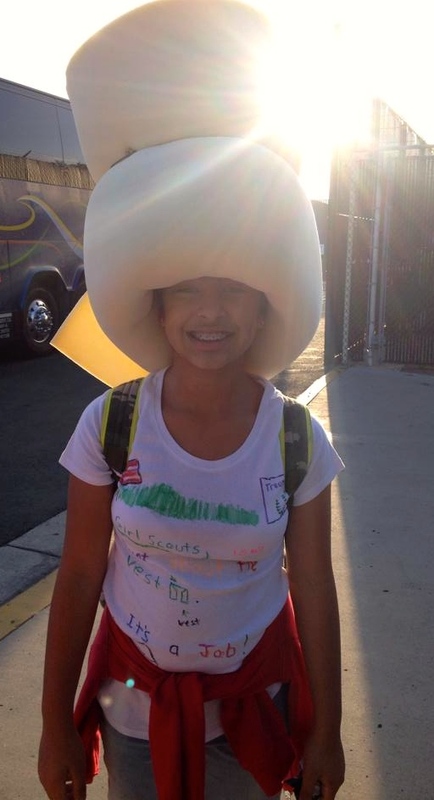 It is not scary because of Sophia, but it does the trick. The children love it. Noah is still changing who he wants to be for Halloween. Now, he wants me to make him Dracula. He wants fangs with blood. He is pretty "chicken little" so it can't be scary. That is my next job. Please continue to pray for my son and well as Terri and her son. I can't wait until she comes back to join us. Have a wonderful week. 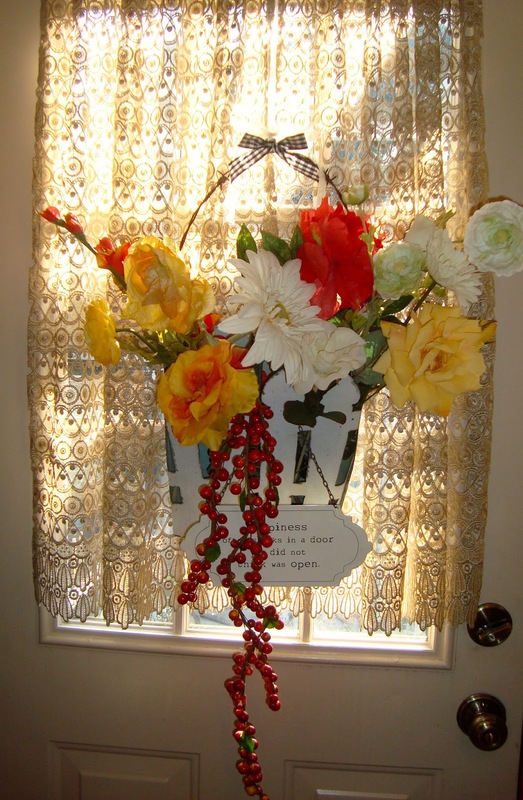 Fun decorating ideas. Enjoy all your good finds! That little confetti set is so cute. Hi Martha. Bet the scrapbookers convention was fun! Love your Konfetti teacup. Your decorating is wonderful! Thanks for hosting! I love all of your amber colored jewelry Martha!! Thanks for hosting! Lucky you finding a best ever estate sale by accident. To have things reasonable priced was a bonus. It's a good thing that you did a backslide as you would have always regretted such bargains. Then you would have went out searching for more. So you're good for now, right? Looking forward to seeing some of the French Country loot! Oh Martha, I just love how you were "weak" and you "caved"! You just make me smile with your sweet posts. Your teacups are both so pretty and ones I've never seen. Your grandchildren are adorable, too. Thanks for hosting and enjoy your week. 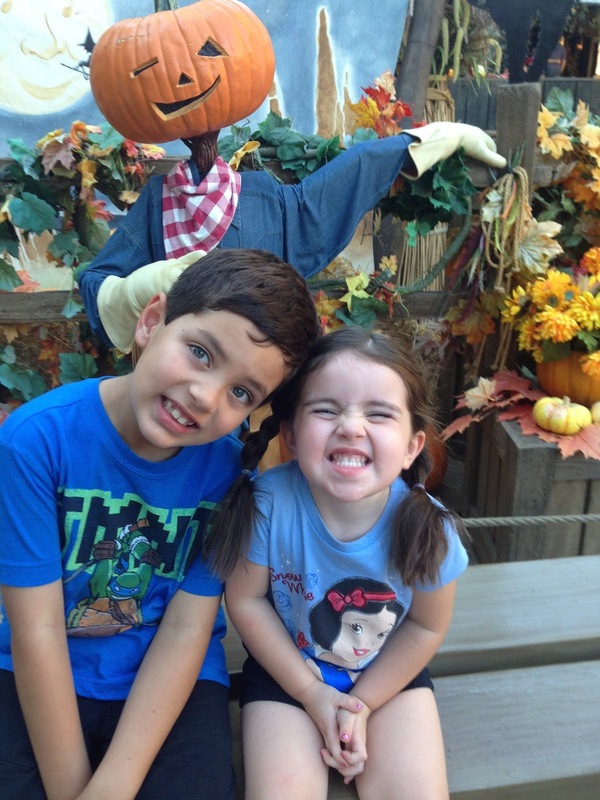 Of course we can't forget the teacups or the beautiful grandchildren at Halloween either! Everything looks awesome sweet Martha...I love this tea party, no matter what we are celebrating! Martha I love the wreath in your top photo and the konfetti cup and saucer, lovely. And of course your gorgeous grands. I guess your grandkids have a great time with you. Your Halloween decoration is great and so are the tea cups. Have fun with all you like to do. Thank you for sharing your treasures and for hosting this sweet event. Your Konfetti cup is really cute and so are the grandchildren! Thanks for sharing and have a lovely day. The Konfetti set is gorgeous, simple but stylish. I'm amazed you have your porch decorated already for Halloween, in England we only decorate for the day. Still, probably more fun your way. What a fun post Martha. Enjoy your lovely finds and those gorgeous grand kids. Hi Martha! 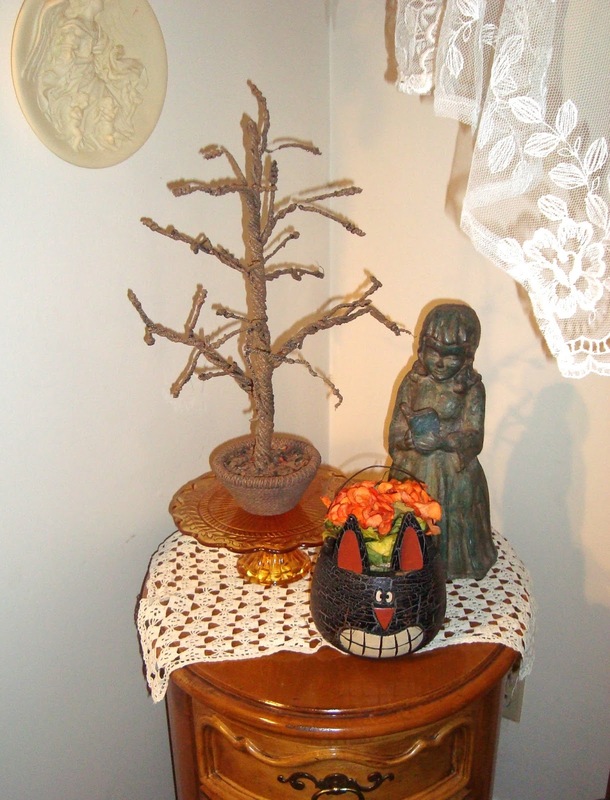 Love your Halloween decorations :) Teacups are definitely a necessity to any décor. It sounds like you got terrific deals from that estate sale--there is no reason to feel bad about that :) Thanks for hosting and have a terrific week! Darling Halloween decor. Love the little "goblin" grands the best. They are so adorable. I'm so happy you got to that estate sale. Once in awhile we deserve to do what we love, don't you think?